Your car doesn't just run off gasoline; it relies on electricity for many of its operations, including starting the car. If the electrical system, which consists of the battery, alternator, fuses, relays, wiring, starter, ignition, spark plugs and wires and numerous other parts, suffers some sort of trouble, it can be difficult to track down. There are some common symptoms though. If you notice any of the following issues be sure to head to your local auto repair shop for further diagnostics. The battery is the source for all stored electricity in the car, so it is often the root cause of complete electrical failure. If your car won't start, and if your key is in the on position and no electronics work, you likely have a dead battery. Batteries wear out over time and need to be replaced, but they can also go dead due to a light left on or some other accessory running while the vehicle's engine is off for an extended period. Batteries that die in that way can usually be recharged via a jump start. So how does the battery stay charged? The alternator is hooked to a belt system that is spun by the motion of the engine, and with that motion it generates electricity. The alternator is able to create power that effectively recharges the battery while the vehicle is running, powers accessories and stores the excess electricity in the battery to start the car. If the alternator fails the battery will quickly be drained and all power will be lost. If a specific system stops working, such as the power windows or the dashboard lights, you will want to check the fuse box. All the electrical systems in your car are routed back to a fuse box to prevent too much electricity from entering a particular system. If a fuse goes bad, which is often referred to as a "blown fuse," the system it is connected to will stop working. This is very common and if this ends up being the problem, it is a very easy and inexpensive fix for most vehicles. Spark plugs create a tiny explosion that power the pistons up and down. They require a small electrical charge in order to do so and if the plugs or the wires they are connected to go bad then the engine will not operate properly. Signs of bad spark plugs include poor acceleration, decreased fuel efficiency or the vehicle engine cranking but not starting. If you're having electrical issues bring your car to a local auto repair shop before you end up stuck on the side of the road with the windows down in the rain. 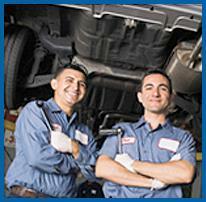 For expert auto electric repair in Covina visit Hye Tech Auto. We can repair any issue your car has! Give us a call at (626) 332-5452 to schedule an appointment for auto repair in Covina or the surrounding area.